One genre of watch which will forever be associated with IWC is the Pilot’s watch. The company from Schaffhausen has a rich history of producing timepieces for use in the cockpit. 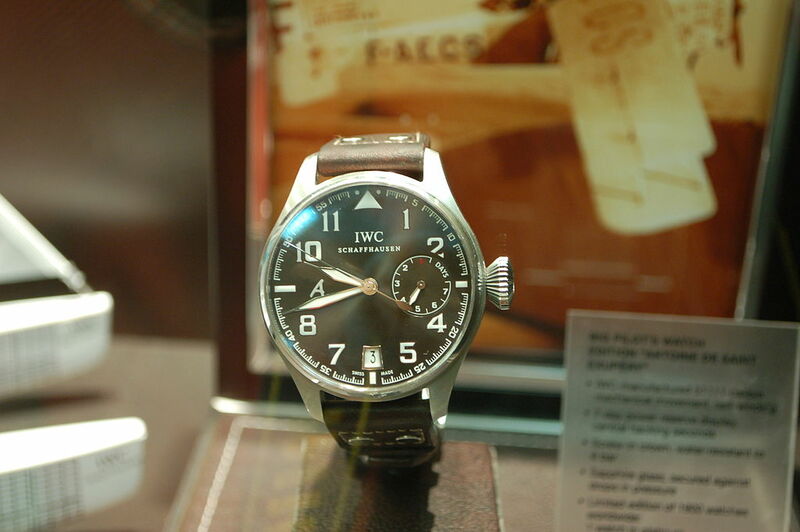 IWC produced its first Pilot’s watch in 1936, named the ‘Special Pilot’s Watch’. This inaugural aviator’s timepiece incorporated a triangular index below noon, anti-magnetic escapement and luminescent dial details. In 1940, IWC released the iconic Big Pilot’s Watch 52 T.S.C with its behemoth proportions intended for wear over the sleeve of a flying suit. The watch resembled the circular cockpit instruments typically found in planes at the time. IWC rekindled the design of the Big Pilot watch in 2002, releasing a modern interpretation of the once Luftwaffe-issue watch. This version (Reference 5002) featured an automatic movement with an impressive power reserve of 8.5 days. Interestingly, a little train within the movement caused this watch to cease after seven days of inactivity, ensuring the accuracy of the timepiece was not compromised by insufficient energy within the mainspring. The watch also had a monochrome power reserve indicator and a date display above 6 o’clock, both specification details missing from the original. The 2002 version of the Big Pilot was smaller than the 1940 original, but still measured a substantial 46mm in diameter. Completing the specification was an eye-catching brown buffalo leather strap with prominent cream stitching. Later versions of the watch (Reference 5004) were fitted with a black alligator leather strap and a red zone on the power reserve indicator to show when the mainspring was devoid of energy. IWC revisited its collection of pilots’ watches again in 2012 and released two additional versions of the Big Pilot in ceramic. The Big Pilot’s Watch TOP GUN Miramar (Reference 501902) was released with a 48mm polished grey ceramic case, beige and red dial detail and a green textile strap. The Big Pilot’s Watch TOP GUN (Reference 501901) featured the same 48mm diameter, but paired a black ceramic case with a black soft strap and employed similar dial colours to the standard 46mm Big Pilot. The IWC Mark 11 was released in 1948 and supplied to the British Royal Air Force. The watch featured the hand-wound 89-calibre movement, shrouded in a soft-iron core to protect the mechanism from magnetic influence. The watch was used by the British military for over 30 years. In 1994, the Mark XII replaced the Mark 11, incorporating a self-winding movement and adding a date display. This movement, the calibre 884, was based on a Jaeger-leCoultre 889/2. The case was 36mm in diameter. The Mark XV arrived in 1999, growing in size by an additional 2mm to 38mm, and was equipped with a modified ETA 2892 movement, the Calibre 37524. The Pilot’s Chronograph, often referred to as the ‘Flieger Chronograph’, was first released in 1988. Early examples included both a self-winding model, based on the trusted Valjoux 7750 calibre, and a meca-quartz watch. The meca-quartz calibre from Jaeger-LeCoultre paired a quartz-based movement for timekeeping with a mechanical chronograph module. The IWC Pilot’s Watch Double Chronograph was launched in 1992. This model is sometimes referred to as a ‘Doppelchrono’ to describe its split-seconds or ‘rattrapante’ complication. The movement combined the Valjoux 7750 calibre with IWC’s own-in-house rattrapante mechanism. In common with the Mark series, IWC has repeatedly revisited the specification of the Pilot’s Chronograph and Pilot’s Watch Double Chronograph, updating the two models on a regular basis. A few of the changes include the repositioning of the subdials, the relocation of the date aperture and the addition of a day display. The size of the watch has also increased over the years, indulging modern tastes for larger case diameters. Early versions of both models included a rectangular shaped hour hand, but these ultimately were superseded by the Big Pilot hands. IWC has enlarged the collection of chronographs to include different case materials, including steel and ceramic options. In 2012, IWC made major changes to the collection. The chronograph was offered for the first time with the in-house 89365 calibre which delivered a greater power reserve of 68 hours, formerly 44 hours. The date display adopted the altimeter format and the dial changed from a tri-compax design to a bi-compax layout. In addition, this chronograph movement featured a flyback function. The new movement was offered in three timepieces, “TOP GUN Miramar” (Reference 38802) featuring a grey ceramic case, “TOP GUN” (Reference 38801) presented in a black ceramic case and “SPITFIRE” in steel or 18-carat red gold. Not all versions of the Pilot’s Chronograph, released in 2012, contained the new in-house movement. The “CLASSIC” in steel retained the Calibre 79320 (ETA base) and tri-compax layout. However, it did feature the new altimeter style date indication. The Swiss watch brand elected to offer the Double Chronograph (Ref 377801) solely in the “CLASSIC” style using the Calibre 79420. This continued the approach of its forebears by using the ETA base in combination with the in-house rattrapante mechanism. Looking at the specification features of the Pilot’s Chronograph and Pilot’s Watch Double Chronograph, several of the historical details of vintage models are retained to this day. These features include the hacking seconds, the soft-iron inner case, a glass secured against displacement in the event of a drop in air pressure and a large triangular index at noon. Browse Blowers selection of IWC Pilot’s Watches online today. Looking for a specific model? Get in touch and we will endeavour to source it for you.